Let me tell you about myself. From my early years in grade school I knew I wanted to help people as a health care provider. When a close family member suffered with severe back and leg pain, I quickly realized that the natural path to healing was with Chiropractic care. When I was 18 years old, I had the opportunity to work with, and witness, the many benefits of Chiropractic healing, while working with the same Chiropractor who cured my mom’s aliments, months earlier. As I regularly saw patients gain their quality of life back, it became clear to me that Chiropractic care was the right career path for me to help people to heal. During my four years of intensive graduate study at New York Chiropractic College, I became even more excited as I learned I could be of service to people, and improve their lives, naturally, without the use of drugs or surgery. Through my studies, I learned that the body could heal itself with the help of the centuries old practice of Chiropractic. I graduated with honors in 1994 and first practiced with another wonderful mentor in Manhattan, New York, before moving to Maryland in 1995. After having the opportunity to work as a clinic director in the Annapolis area, I opened my practice in Owings Mills New Town in 1996. I enjoy treating a variety of musculoskeletal conditions and other ailments while using a conservative gentle approach. I believe in the use of various treatment methods including hands on techniques, exercise, posture, nutrition and patient education. A common goal I strive for in treating all of my patients is the prevention of recurrences and continued general health & wellness. I believe in treating people with respect and compassion as I would expect if I were a patient. In my 17 years of practice, I feel fortunate to have enjoyed treating, healing and educating my patients on health and wellness. I’m Board Certified by the States of Maryland and New York, and by the National Board of Chiropractic Examiners. I’ve been entrusted to take care of newborns, professional athletes, other health care professionals and I have delivered over 100,000 spinal corrections. My partner in practice is also my partner in life! I have been married to Robin L. Steinberg, M.P.T. for 13 amazing years. We have been practicing together now for 11 of those years. We have four beautiful boys that help keep us plenty busy at home. When not tending to the needs of my patients and practice, I enjoy spending time with my family, skiing, exercise, sports and coaching youth soccer. I follow a healthy diet, get my spine adjusted regularly and stay active to remain fit. In our practice, we have combined the benefits of Chiropractic and Physical Therapy in a caring environment, and we try our best to make you feel at home. Thanks for visiting our website! I look forward to meeting you in person and learning how we may be of service to you. Call for an appointment so we can help you take your first step toward better health! 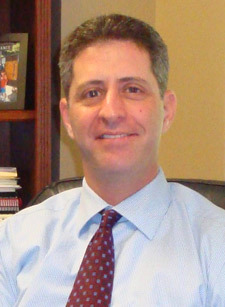 Gregory D. Kersh, D. C.